The Earth system is characterized by cycles of physical quantities which manifest as component interactions. In recent years, the dust cycle has emerged as a core subject of the Earth system science, because dust participates in many physical, chemical and bio-geological processes which interfere with the cycles of energy, carbon and water. Each year, about 2000 Mt dust is emitted into the atmosphere, of which 1500 Mt is deposited to the land and 500 Mt to the ocean. Dust carries organic matter and contributes directly to the carbon cycle. It also transports iron which is vital to ocean productivity and ocean-atmosphere CO2 exchange. On the other hand, dust as aerosol significantly affects the energy balance of the Earth system through absorption and scattering of various radiation components in the atmosphere and through the modifications of the optical properties of clouds and snow/ice surfaces. Thus, the cycles of dust, carbon and energy are closely inter-related. Shao, Y., A. H. Fink, and M. Klose (2010), Numerical Simulation of a Continental-Scale Saharan Dust Event, J. Geophys. Res., doi:10.1029/2009JD012678. Klose M., Y. Shao, A. H. Fink, M. K. Karremann, 2010: Sahel Dust Zone and Synoptic Background. Geophys Res Lett 37, L09802, doi:10.1029/2010GL042816. New schemes for dust emission and deposition are being developed. Three dust emission mechanisms have been identified, including saltation bombardment, aggregates disintegration, and direct aerodynamic entrainment. The classic view is that dust emission is related to the motion of sand-sized grains, which is driven by the mean wind (Fig. 1a). Relatively strong winds are needed to initiate the movement of the large particles. Aerodynamic entrainment is often neglected in dust models. However, under convective atmospheric conditions, when turbulence is strong and wind is weak, dust plumes and dust devils are often observed and can produce significant emissions. The mechanism of turbulent dust emission differs from the conventional view. In a convective boundary layer, large-eddies can reach sizes comparable to boundary layer height and effectively transfer momentum to the surface (Fig. 1b). Consequently, the surface intermittently experiences large shear stresses, which can entrain dust into the atmosphere. This means that turbulent dust emission is a stochastic process and saltation does not need to be involved. Although the intensity of turbulent dust emission is expected to be much weaker than saltation induced emissions, we hypothesize that the cumulative amount of turbulent emission, due to its high frequency of occurrence, may be substantial. We develop a new dust emission scheme for the parameterization of turbulent dust emission (Klose and Shao, 2012). Herein, turbulent emission is described as stochastic process. Large-eddy simulations (LES) have been carried out to investigate turbulent dust emission for different atmospheric conditions (Klose and Shao, 2013). The analyses of the numerical experiments were focused on two issues: (1) How is turbulent dust emission generated by convective turbulence and how is it controlled by atmospheric stability; and (2) How are surface shear stresses produced by atmospheric turbulence and how can they be quantified. The LES results were used to improve the dust emission parameterization of Klose and Shao (2012). See research gallery turbulent dust emission visualizations. Figure 1: (a) Conventional view of dust emission via saltation bombardment; (b) Illustration of convective turbulent dust emission. Dust in the atmosphere is an important aerosol which profoundly affects the radiation balance of the climate system. However, dust deposition is extremely poorly represented in GCMs, such that the global dust budget has large uncertainties. The lack of high-quality dust-deposition measurements has been a serious limiting factor for the progress of dust research: we often cannot test the rationality for and calibrate the parameters in the dust-deposition schemes. In this DFG founded project, a series of wind-tunnel experiments on dust dry-deposition is carried out, in collaboration with the Lanzhou University of China. 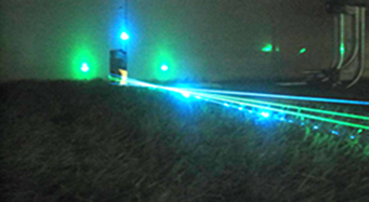 Advanced laser instruments are used, such as PIV (Particle Image Velocimetry), PDPA (Phase Doppler Particle Analyzer) and Aerosol Spectrometer. Dust concentration and dust-particle velocity are measured for various particle-size groups, flow velocities and surface conditions. This work enables us to establish a reliable and comprehensive dataset for the validation of existing dust-deposition schemes and for the conceptualization of new schemes. Laser instruments in action in the wind-tunnel experiments on dust deposition. The interactions between the atmosphere, terrestrial hydrosphere and biosphere are determined by processes which are in turn strongly influenced by the patterns and structures of land-surface properties. It is well-known that land-surface heterogeneity, both spatial and temporal, influences atmospheric processes and feedbacks on a wide range of scales. However, our present quantitative understanding and predictive capability of heterogeneous land-surface processes is limited, due to the lack of observations and the lack of a theoretical framework which captures the pertinent multi-scale processes. We have been developing a model for the simulation of heterogeneous land-surface processes with high spatial and temporal resolutions (see 2a). This work is an important component of the Transregional Collaborative Research Centre (TR32), and the performance of the model is being tested against the TR32 field measurements. This research is significant in that it leads to improved understanding of the soil-vegetation-atmosphere feedbacks and a powerful tool for synthetic data generation and benchmarking of heterogeneous land-surface processes, which cannot be achieved through field and laboratory observations. The system allows simulation of surface flux patterns on scales from meso-? to inertial. In this project, we develop a large-eddy atmosphere and land-surface simulation model (LES-ALM) for investigation of atmosphere-land interactions over heterogeneous surfaces. LES-ALM is composed of a large-eddy flow model, a land-surface model, a canopy drag model and a radiation model. The performance of LES-ALM has been tested in both synthetic and real-case simulations. The model is capable of correctly producing turbulent features over urban canyons and in convective boundary layers. Simulations show that under convective conditions, large eddies can effectively transport water vapor from the surface to high levels. A real-case simulation for a TR32 field site shows that the simulated surface fluxes are comparable with the measurements. It also shows that the spatial patterns of surface fluxes are mainly determined by the land surface properties, but are to a degree affected by advection. A new approach to quantifying land surface heterogeneity is being developed and further model developments are being carried out. 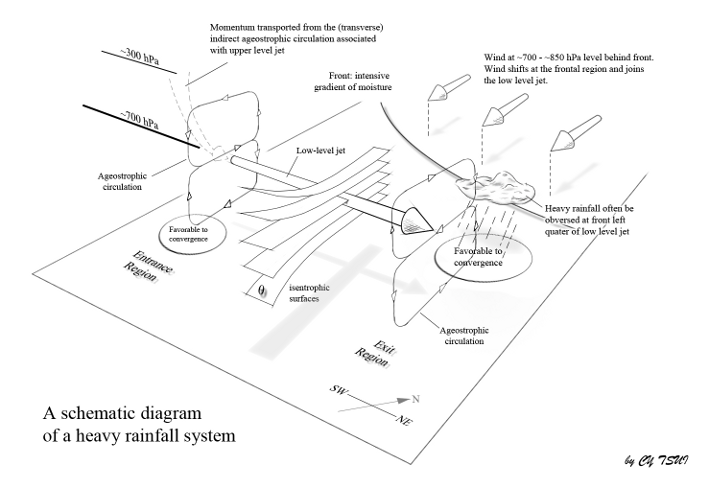 Heavy rainfall in southern China is a complex problem which involves the thermodynamic interactions of atmospheric systems on three different scales: convective scale (e.g. cumulus), meso-scale (e.g. low-level jet) and large scale (e.g. upper-level jet). For the simulation of such systems, the numerical models based on Reynolds averaging and sub-grid closure have fundamental limitations in that they cannot represent cross-scale interactions and the small-eddy assumption embedded in the sub-grid closure is invalid. A multi-scale model is being developed for better modeling of meso-scale convective system which produces heavy rain in China. 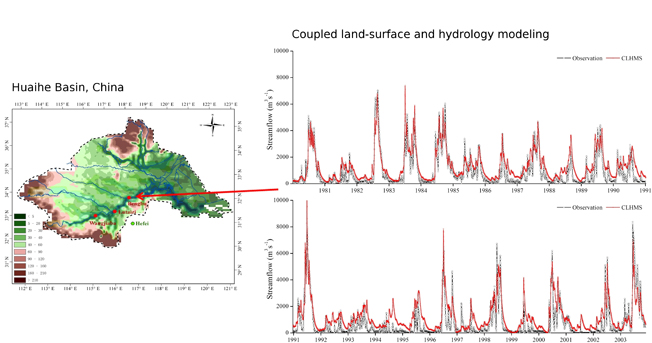 In collaboration with the Institute of Atmospheric Physic of the Chinese Academy of Sciences, we have been working on the hydrological response of the Huaihe Basin to climate change by means of integrated modeling and data assimilation. The basin is a key economic region of China, which suffers severe water shortages and its water resources are sensitive to climate change. A Regional Atmospheric–Hydrological Modeling System (RAHMS) is being developed and implemented to the basin with high spatial resolution. We use the system to investigate how climate in the basin changes and how the water cycle responds to such changes, especially under extreme climate conditions. The system also has the capacity for flood prediction.